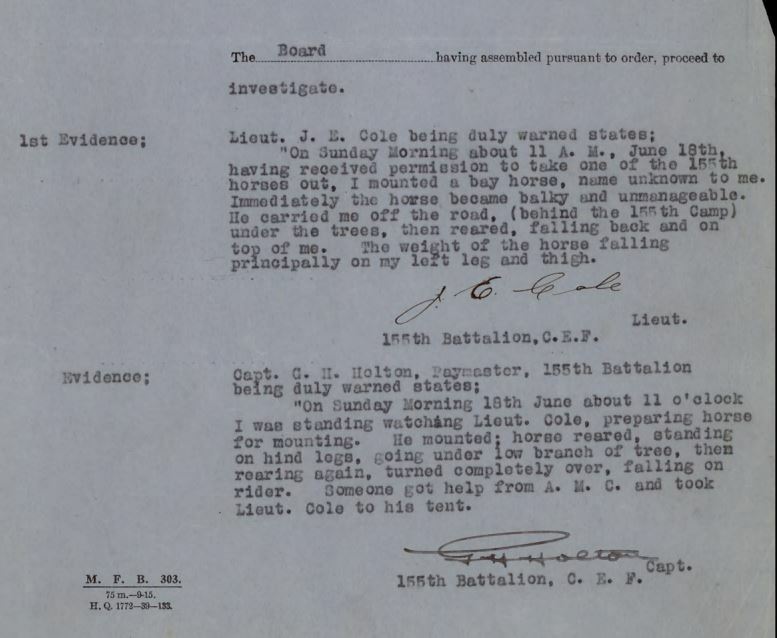 James Cole completed an Officer’s Declaration Paper in Marlbank on this day in 1916. He was born in Deseronto on October 20th, 1897, the son of James Cole and Eliza (née Brown). The family were living on Upper Mill Street in Deseronto at the time of the 1911 census. James attended Deseronto High School and described himself as a student when he signed up. His service record notes that he originally enlisted in November 1915 in the 155th Battalion of the Canadian Expeditionary Force. “On Sunday Morning about 11 A. M., June 18th, having received permission to take one of the 155th horses out, I mounted a bay horse, name unknown to me. Immediately the horse became balky and unmanageable. He carried me off the road, (behind the 155th Camp) under the trees, then reared, falling back and on top of me. The weight of the horse falling principally on my left leg and thigh. “On Sunday Morning 18th June about 11 o’clock I was standing watching Lieut. Cole, preparing horse for mounting. He mounted: horse reared, standing on hind legs, going under low branch of tree, then rearing again, turned completely over, falling on rider. Someone got help from A. M. C. [Army Medical Corps] and took Lieut. Cole to his tent. By July 19th Cole had recovered and was declared fit for duty. He travelled to England on the RMS Olympic, arriving on August 30th. He joined the 42nd Battalion in France on September 23rd. 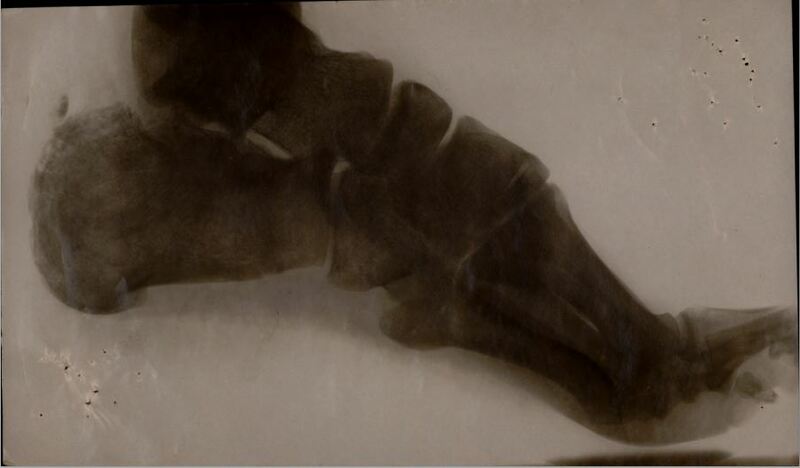 On November 29th, 1916 Cole was injured when a high explosive threw him into a wooden support. Shortly afterwards he was admitted to hospital with renal colic, caused by damage to his kidneys in the incident. He was sent to England to recover and was transferred to the 20th Reserve Battalion in March 1917. He reported abdominal pain in April and had his appendix removed on April 11th. He was discharged from hospital on May 17th. In October 1917 Cole was attached to the Royal Flying Corps as an observer. On December 8th he was shot in an air fight over Cambrai in France: the bullet hit his left heel and caused a compound fracture. The Royal Flying Corps casualty card noted that he was in a DH 4 aircraft with a Rolls Royce engine at the time. Cole spent the next two and a half months in hospital in England and was discharged to Canada on March 1st, 1918. On April 11th he was admitted to Kingston General Hospital with pain in his left heel. In September he had an operation at Toronto General Hospital to remove abdominal adhesions. In August 1919 he was admitted to the St. Anne de Bellevue Military Hospital in Quebec complaining of pain in his abdomen and left heel. He was discharged in December 1919. In 1921 Cole was living with his parents in Main Street, Deseronto, where his father worked as a barber. James’s occupation was given as ‘apprentice barber’. 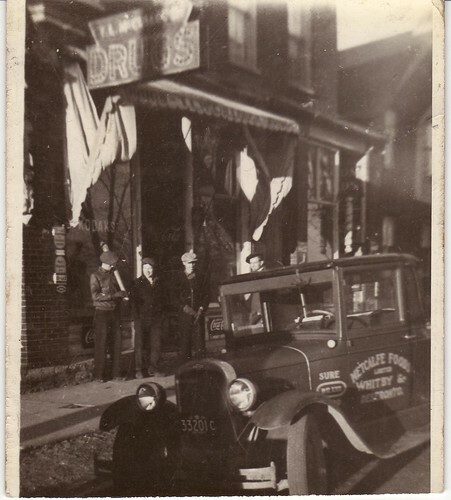 The photograph below shows the Cole’s barbershop at 305 Main Street, on the right of the image. James died in Penticton, British Columbia on July 14th, 1967.